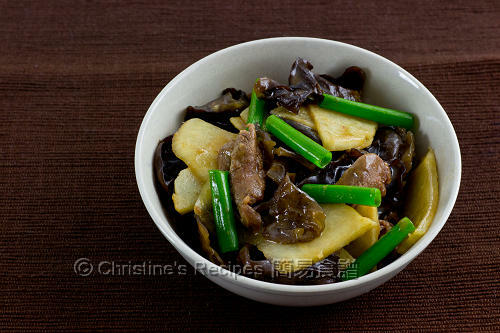 This is a traditional Chinese stir-fry dish that I tried and loved when I was very small. The slightly sweet and crunchy flesh of yam bean impressed me very much. Yam bean (aka Jicama), a kind of edible root vegetables, is widely used in Chinese cooking actually, quite easy to get it from any markets in Hong Kong. It comprises of high quantity of fiber and anti-oxidants and can be eaten as raw. That said, yam bean can remove body heat and help control blood pressure. 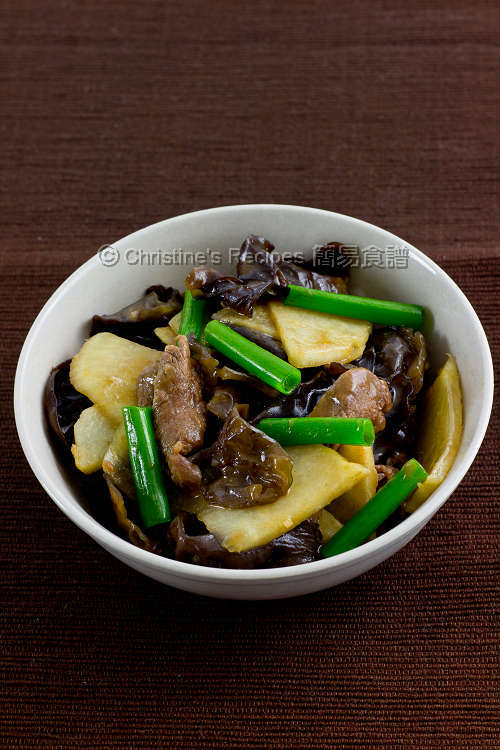 I love its crunchiness going so well with the juicy stir-fried beef. Once the dish was served, I finished nearly half of it by myself. Soak the cloud ears until soft. Trim the hard stems. Blanch in boiling water. Drain well. Cut into smaller pieces if they are too large. Set aside. Thinly slice the skirt steak against the grain. Mix with marinade. Set aside for about 15 minutes. Peel the yam bean with a knife. Cut into thin slices. Set aside. Heat oil in a wok or a frying pan. Saute the shallot over medium heat. Toss in the yam bean and cloud ears. Stir to combine. Pour the chicken stock. Cover and cook for about 5 to 8 minutes, or until the yam bean is just cooked, yet remains crunchy. Dish up and set aside. Add some oil in the wok. Stir fry the beef until 80% done. Add the ginger and white parts of spring onion. Stir to combine. Toss back the yam bean and cloud ears. Add the sauce and green parts of spring onion, cook to preferred consistency. Serve immediately with steamed rice. The flesh of yam bean tastes slightly sweet with crunchy texture, available at Asian grocers. 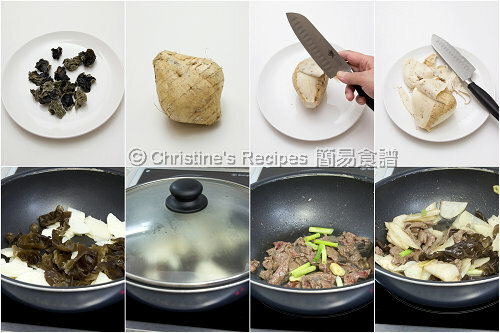 It’s often used to stir fry with meats in Chinese cooking. You can replace the beef with pork or chicken. It’s equally delicious. I miss jicama!! Used to eat them raw as an afternoon snack...so juicy and great. Your stir-fry looks mouthwatering, Christine. Look Simple but very high nutrition dish! Thks Christine for sharing! It's very delicious. Thank you so much for sharing your recipe. Both my husband and I love it so much. Love you blog and look forward to trying more recipes.